Bella and Vogue goes to London! Oyster Cards, Greeters, Starbucks and Fun! I am so excited to finally share with everyone all about my recent trip to London!! So as mentioned in one of my recent travel posts which you can read about Here . One of my friends wrote to me on Facebook asking if I would like to go to London for a few days during the Easter break. Of course I said Yes and accepted her offer straight away. London is such a glamorous city and everyone is so fashionable, I was dying to go! So that night we started to look up flights and hotels. We decided to fly with Ryanair. I think our entire flights came to around 70Eur each, for return flights which was really good for the time of year it was. We booked our hotel on booking.com.The hotel was called The Norfolk Plaza Hotel. It is located on Norfolk Square in Paddington. It is such a pretty street and the architecture on all the buildings are so beautiful. here's a photo of the street. Isn't is pretty! You can see the entrance to the hotel on the left of the photo! We got a triple room and stayed there for two nights. I think it cost 220 Eur. We checked into the hotel and the staff were so friendly and welcoming. The hotel is very quint and the hall ways are very narrow but it is clean, in a safe area and perfect location for the tube. Our room was very big and spacious. It was a basic standard room but do you no what that's all we needed, it was clean and cleaned and restocked with towels etc everyday. Don't spend a lot of money on hotels, you wont be spending to much time there anyway. You will be out shopping and site seeing! * When using your oyster card make sure to swipe you card both on the way in and out of the tube stations even if the barriers are open. We didn't swipe our cards when the barriers were open and we got charged extra and had to top up our cards but when giving back your cards the day you are finished with them you get 5 pounds back for bringing back your card and the extra money you had to top up by back! Weird system I know! Next stop Westfield shopping center!! Westfield London really is the ultimate shopping experience. 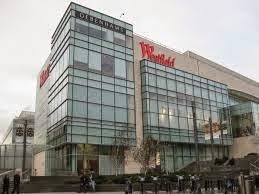 It is the biggest shopping center I have ever seen. As soon as we arrived outside we just couldn't believe the size and all we wanted to do was shop. Walking in the door we saw about 10 different shops each that we wanted to check out. We split up so that we wouldn't waste time going around all shops as we only had a few hours and we knew that this trip we wouldn't be able to make it back. We're going to have to go back to London again! My favourite shops were River Island, Topshop, Newlook, Oasis had some nice things too but I was hoping to check out the Molly King collection Loved by Molly but they didn't have it, Victoria Secrets and Zara! So many shops you really are spoiled for choice. After shopping for a while we stopped in Nandos for dinner since we hadn't eaten since we were in the airport in Ireland that morning. Later that evening we had a cheeky treat in Starbucks as a quick pick me before we started shopping again. We shopped for a good hour or two after our Starbucks break and then we headed back to our hotel, we were absolutely exhausted as we had been up from 6am that morning and this was like 8pm when we left Westfield so we really did make the most of our first day in London. Although it was very overwhelming getting used to the crowds of people, the business of the tubes and the huge shopping center I adored every second of it and would give anything to be back in London!